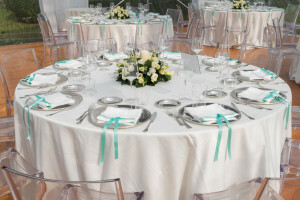 When you’re creating your budget, of course you’ll factor in the main expenses – your venue, catering, flowers, etc. But there are lots of smaller expenses that you might not initially consider that can add up. Check out Wedding Wire’s list of wedding expenses that you’ll need to consider. Depending on the size, weight and shape of your save-the-dates and wedding invitations, you can end up paying an additional dollar per invitation, which really adds up! Most wedding gowns won’t arrive and automatically fit you like a glove – and alterations can cost several hundred dollars. And if you’re buying an inexpensive sample gown that needs lots of work done, you may end up paying more in alterations than on the actual dress! Your best bet is to choose a gown that you pretty much love as is – that won’t require adding straps, changing the silhouette, or any major overhauls. Some venues will require you to pay a cake cutting fee for them to slice and serve your wedding cake – it’s often $1 or so per slice. As for the corkage fee, your venue may change for their opening and serving alcohol. You can always ask that the charges be waived, or you can avoid the cake cutting fee all together by serving cupcakes! You’ll need to tip most, if not all, of your vendors. Sometimes gratuities are included as part of the vendor’s fee, but sometimes this isn’t the case so you’ll need to read contracts carefully. Tips vary by vendor but are usually 15 to 20 percent of the total fee. And remember, you’re not only tipping the actual vendors, but the people who make deliveries, the waitstaff, coat check attendants, and more. While these gifts don’t need to be pricey, if you’re having a big wedding party, they can add up. Depending on what your venue offers, you may have to rent everything from tables to chairs, plates to flatware and glassware – and of course, linens. Make sure to factor these charges in when putting together your budget. It’s important for you to have a trial of your hair stylist and makeup artist to make sure you’re all clear on how you’d like to look on your wedding day. Sometimes these trials cost as much as actual wedding day service, so be prepared. Wedding Wire offers a way to track your spending with their Wedding Budget Calculator – Decide where you want to save or splurge and create a budget that you can stick to.